Thanks be to God that we have the Bible! That we have these words inspired by the Holy Spirit, and written by the eyewitnesses of God’s works among us. Thanks be to God that He has commanded to read and reflect on these words every week, and that He Himself brings us together to listen to Him. We need to thank Him daily for all these wonderful gifts, because, we need them. We desperately need them. The reason why we need them is that we tend to forget the most important parts of God’s message to us. That’s nature of our sinfulness. We forget, or we don’t believe the most significant parts of God’s message to us. We need to be reminded of them again and again and again. We need to hear our Father and our Lord Jesus speak to us His truth so that our minds can be renewed and our hearts can be transformed. For example, todays readings from the Scriptures remind us about what it means to be a Christian. How great, how incomprehensibly great gift and how precious identity it is. We tend to forget about it. We all do. It is so sad, but I encounter it too often that Christians have begun to believe in all sorts of sad and shallow caricatures about Christianity. Like the one that to be a Christian means to be a nice and moral person. To live according Christian values, whatever it means. To be honest, friendly. Do not murder (we are usually pretty good with that one), do not steal (or at least not too much), do not commit adultery (or at least don’t get caught). Do not lie (or at least, don’t lie too often), treat others in a fair way, and may be even worship sometimes. Sometimes. Generally, be good, be moral, be nice. At least in our own eyes. … so that people could look in a mirror and celebrate how nice persons they are. Come on! Are you buying this? If that’s all that there is, why would anyone even wanted to be called a Christian? It saddens me every time, when I see that Christians, meaning, my brothers and sisters in Christ, have forgotten God’s wonderful truth about what it means to be a Christian and have bought into such shallow misperceptions. Thanks be to God for the Bible, thanks be to our Father in heaven that He invites us and commands us to listen to Him, so that we can be reminded of His wonderful truth and renewed in our minds. So, what does it mean to be a Christian? Today’s readings from the Scriptures describe it well. It is about God’s presence with you and in you, it is about a new identity, new life, new worth, new joy, new hope, and the list goes on. Remember, when the prophets foretold the coming of Jesus, they told that He would come in the power of God’s Spirit. Then in the gospels we can see how the Holy Spirit was active at Jesus conception. We can read how the Holy Spirit was active in Jesus’ baptism, how Jesus did His ministry in the power of the Holy Spirit, and how He was raised from the dead in the power of the Holy Spirit. Now, before His ascension back to the Father Jesus promised something – that He Himself would be with us till the end of this age, and that He would send us the Helper, His Holy Spirit to be with us and to dwell in us. This is exactly what happened on that Pentecost many years ago. Think about it this way. Jesus ascended to the Father and left His Church to continue His mission. Jesus gave to His Church, to you, His own Holy Spirit. This is, why Paul the apostle calls the Church, he calls you the body of Christ. For the Holy Spirit now dwells in you. The Triune God now dwells with you. This is, why Paul can call you the temple of God, for this is who you are. You are God’s holy people not because you are nice or moral, but because the holy God Himself dwells with you. He comes to us when we are imperfect, broken, when we have failed. His presence with us is unmerited and undeserved gift of God, given out of the Father’s sheer goodness and mercy. Whenever we read in the Bible about the holy God appearing to His chosen people, almost every time there is this imagery of fire present. In the Pentecost, with the Holy Spirit descending as flames of fire, it was revealed that this same holy God has come to dwell with His people, that He takes home with us. This is what makes you a Christian. God’s presence. His Spirit. And as He makes His home with you, He gives you new identity, – a child of God, an heir of God’s Kingdom and co-heir with Jesus Christ. That’s also God’s gift to you. This is your true and the most important identity here, and in the age to come. These days people often struggle with self-worth, with self-esteem. Then we do different things only to have some worth. Be in found in possessions, or fame, or achievements, or looks, or status, or whatever the world values. And then we realize that it doesn’t work. Jesus determines what your worth is. You know that everything has such worth that someone is ready to pay for it. Jesus Christ, the Son of God was ready to sacrifice His life, so that only He can have you with Him. This is how valuable you are for your God. Nothing can trump it. Besides, as we heard it read today, the Triune God has given all Christians this tremendous power and authority. You have the authority to forgive someone theirs sins and they will be forgiven in heaven. Just think about it! Jesus has given you His Spirit, He has given you this authority to forgive people their sins, and has sent you to do it. You have your new identity, you have God’s Spirit, you have the authority to announce to people God’s forgiveness and to lead them to eternal life. This is what it means to be a Christian. Have this picture before your eyes, – when you go and tell people about what the Triune God has done and has prepared for them in Jesus, the Holy Spirit, as flames of fire goes forth and touches their hearts. As you speak Jesus’ message, the Holy Spirit creates new hearts in your listeners, He creates faith and new children for God the Father. And all of this happens through you. For you are God’s own messengers. This is what it means to be a Christian. Truth and reality surpasses our imagination. This God thinks and acts big. He has called you, He has made you His child, He has given you His Spirit, He has sent you to be His messengers, and He has promised to have you with Him, where you will see Him as He is. As He is… face to face. This is what it means to be a Christian. To have all these wonderful gifts and promises of God the Father and the Son and the Holy Spirit. We could go on and on describing what He has done and does for you and what He has prepared for you. There is so, so much… This is, why the Father commands us to come together regularly, so that He could remind us about this wonderful reality. I pray, Brothers and Sisters in Christ, that you would never think less of what it means to be a Christian than we just discussed. Don’t dishonour the precious name of Jesus by believing in shallow caricatures or living accordingly. Being nice and moral in your own eyes doesn’t make you a Christian. It only makes you nice and moral. Holy God’s presence with you, your new identity, your new life, new hope, new future is what makes you a Christian. Jesus makes you a Christian. And, of course, when the Holy Spirit comes to you and dwells with you, you can’t sit still. He kindles in your heart the passion to please your God and to care for all people in your life. He then drives you to come in God’s presence and to listen to Him. He then drives you out to serve all people self-sacrificially, considering others as more important than yourself. You don’t become a Christian by being moral, instead, all the good things that you as a Christian do, are good fruits of the Holy Spirit dwelling with you. Remember these things. Cherish them in your hearts. Remember, regardless of who you are and what you have or haven’t done, you are loved, you are cared for, you are protected, you are blessed, you are valued by Jesus more that you could ever dare to hope for. This is what it means to be a Christian. It is a joyful, joyful thing. 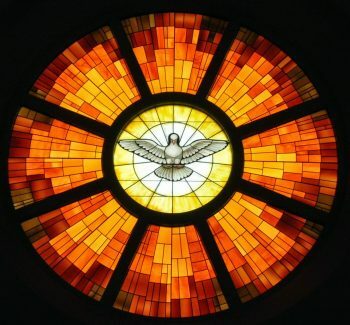 Today, as we remember this Pentecost event, receiving of the Holy Spirit, I pray that we all could joyfully live out our identity as God’s children and His messengers. I pray that the Holy Spirit gives you courage, gives you opportunities, gives you passion to tell about Jesus to all who don’t know Him yet. So that the flames of the Holy Spirit through your words would kindle their hearts and would expand the Kingdom of God among us. For this is, why we are here. And the peace of God that surpasses all our understanding, keep your hearts and minds in Jesus Christ. Amen.